Try these senior fitness tips to help you get fit and healthy at any age. Fitness for seniors is not a modified exercise program nor is it a special diet. It's a lifestyle that will help promote health and minimize medical issues. Fitness at any age for some people is a struggle while others seem to breeze their way to a healthier body. Trust me; these people don’t actually just breeze through it. Everyone from teens to seniors need to think about it and take action in order to get fit and stay fit. As we age there are more hurdles for us to jump over in order to get fit. Our bones are getting weaker, our joints ache more and our metabolism has slowed way down. I don’t know about you, but when I hit 40 (which I denied for a whole year) I started noticing some changes. My knees cracked in the morning when getting out of bed, I couldn’t stay up at night like I used to and I started noticing the effects of the slowing metabolism. It was time to change my life style and the way I approached foods and activities. If you are like me and are starting to feel some effects of aging, then use these tips to get you started on your fitness lifestyle and help build your senior exercise program. This is probably the most important senior fitness tip. Before you dive right into any senior exercise routine, change your eating habits or any life style changes make sure you know whether you have limitations. If you are not sure what these may be, check with your doctor. If you have health risks these may limit your choices for your workouts and/or your food selections. Seeing your doctor before starting any exercise is always sound advice but is not always followed. There is no set age or circumstance that dictates if/when you should see a doctor before exercise. You have heart, liver, kidney or lung disease. You have asthma, arthritis, osteoporosis or diabetes. You have pain in your chest, joints or muscles during physical activity. You have had joint replacement surgery, have an untreated joint or muscle injury or persistent symptoms after a joint or muscle injury. You have a loss of balance, dizziness or loss of consciousness. You are currently taking medication for a chronic condition. Don't believe all that you hear about exercising for seniors. Check out this article on the myths for working out as you age. Remember it took you 40 plus years to get where you are today so don’t expect to lose tons of weight and get fit overnight. If you have led a sedentary life for many years, then it will take some time to get used to being more active. Buy a good pair of walking shoes and start taking leisurely to moderate speed walks as a start. Once you have broken in your new shoes and feel that you are ready, step it up to a brisk walk. Be sure you are walking correctly in order to minimize shin splints and joint soreness. Mix up your exercise choices by adding something new and fun. Water aerobics is a great senior fitness exercise. Or try something you enjoy like gardening, golfing or even bowling. Here are even more fun activities that burn calories. If you don’t always have time for the golf course or the bowling alley, try getting fit with Wii. Video games have come a long way since we were young. Gaming has gone virtual and gets you up and moving. Try playing Wii golf or Wii fit. Getting up and active is the first step to getting fit for seniors. But don’t just limit your activity to aerobic exercises. Add some strength training to your weekly workouts. Strength training is not just for body builders. More and more seniors are picking up the weights and getting fit with strength training. Building lean muscle not only helps you get fit but has many health benefits as well. Strength training helps lower the bad cholesterol and raises the good. You also get the benefit of increased bone mineral density and overall increase in strength. But the benefits don’t stop here. This senior fitness tip not only strengthens the muscles but also strengthens your bones, improves posture and more. Be sure to check out all the benefits of strength training. Have you noticed that you are getting the “middle aged” spread? Well welcome to the 40 plus age. No longer can we eat what we ate just 5 or 10 years ago. Remember, your metabolism has slowed down which means you need to consume fewer calories in order to just maintain your weight, let alone lose weight. You may have been able to eat what you wanted in the past, but now it's time to make changes. This senior fitness tip is all about making some changes in your calorie consumption. This may not seem fair but it's what we have to deal with. Adjust your food intake and lower the calories if needed. Double check your calorie needs with this free online weight loss calculator. This calculator will give you your calorie consumption for maintaining your weight as well as recommended calories for losing 1 pound a week. Learn more about losing weight over the age of 40. To help you with your senior fitness program, here are some useful links to other useful pages and products. 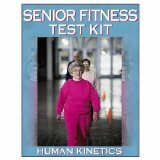 Here's a senior fitness kit that includes the test manual and the fitness test software. In the past most physical fitness tests have been geared towards the younger crowd. The updated Senior Fitness Test Kit addresses this problem and is geared towards senior adults. It is a simple, easy-to-use battery of test items that assess the functional fitness of older adults. The test is safe and enjoyable meets scientific standards for reliability and validity, and it has accompanying performance norms based on actual performance scores of over 7,000 men and women between the ages of 60 and 94. Gaining weight during and after menopause is not that uncommon. Find out why this happens and how you can avoid packing on the extra pounds. Don't let your age keep you from reaching your goals. Read this article for tips on losing weight even after the age of 40.